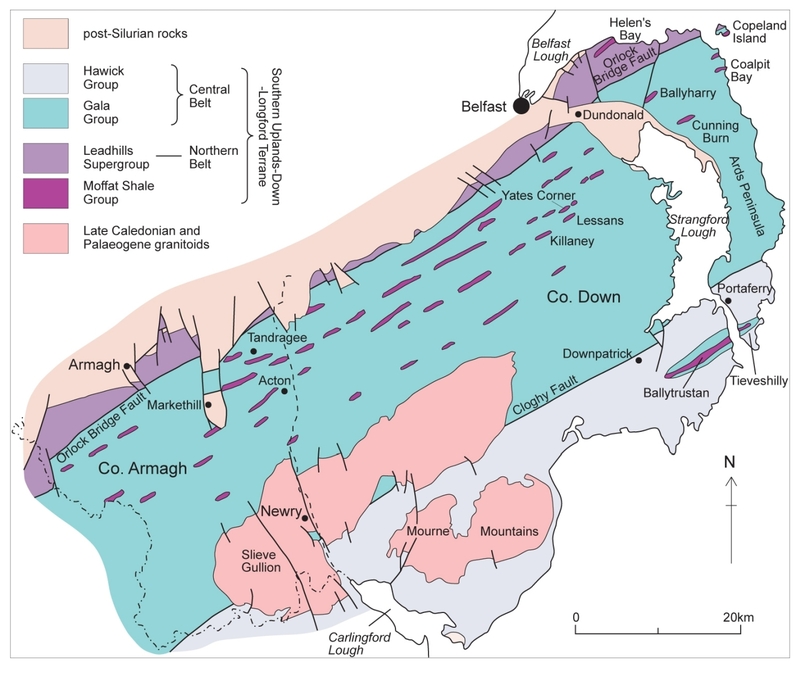 Beneath the drumlin cover, much of the bedrock of Counties Down and Armagh consists of Lower Palaeozoic marine sedimentary rocks. These are part of the Southern Uplands-Down-Longford Terrane (P947802), which is one of the most distinctive terranes in the collage assembled by orogeny in the Ordovician, Silurian and Devonian periods to form the Irish and British Caledonides. 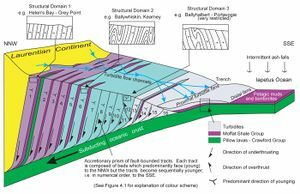 The terrane is an allochthonous prism composed almost entirely of thick, well-bedded Ordovician and Silurian turbidite sequences comprising greywacke sandstone, siltstone and mudstone. In addition there are several thin formations consisting of chert and spilitic lavas, and black and grey mudstone with bentonites (ash falls from a volcanic arc). Throughout most of the terrane the beds strike ENE-WSW with almost uniformly steep dip which combines with the apparently monotonous nature of the thick turbidite successions to pose difficult stratigraphical and structural problems. Although the dominant turbidite successions are largely unfossiliferous, a few graptolites occur in the interlayered mudstone and rare shelly fossils have been found as clasts in coarse sandstone beds. Chert and lavas of the Crawford Group, cropping out in the northwestern part of the terrane, are the oldest rocks in a stratigraphic succession whose base is not exposed. These remnants of oceanic crust are succeeded by the Moffat Shale Group, a stratigraphically condensed succession of grey and black mudstone less than 150m thick, which is overlain conformably by turbidites. Rich graptolite faunas in the Moffat Shale Group provided the basis for Lapworth’s classic studies of graptolite palaeontology and Ordovician stratigraphy in the latter half of the 19th Century . The high biostratigraphical resolution provided by the graptolite faunas remains key to the understanding of the lithostratigraphy and structure of the terrane. 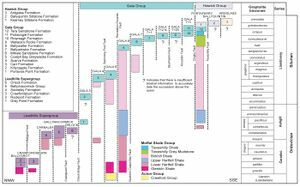 Understanding the sequence of graptolite zones subsequently facilitated Peach and Horne’s division of the Southern Uplands of Scotland into Northern, Central and Southern Belts . The Northern Belt consists entirely of Ordovician strata, the Central Belt is early Silurian (Llandovery) with numerous, small, Ordovician mudstone inliers, and the Southern Belt is of mid- and late Silurian (Wenlock and Ludlow) age. Although all three belts can be traced into and across the northern part of Ireland, only the Northern and Central Belts crop out in Counties Down and Armagh. Across both belts the high-resolution graptolite palaeontology unequivocally demonstrates that, despite successions which dominantly young northwards, progressively younger sediments crop out towards the south. The late 19th Century geologists attempted to explain the relative ages and distribution of the graptolite faunas in the Southern Uplands of Scotland by arranging the strata around numerous upright tight or even isoclinal folds . Thus on contemporary Geological Survey maps of the Southern Uplands, and of Counties Down and Armagh, the many outcrops of the Moffat Shale Group were interpreted as forming the cores of tight periclinal anticlines and so appear in plan view as boat-shaped inliers within the younger turbidites. 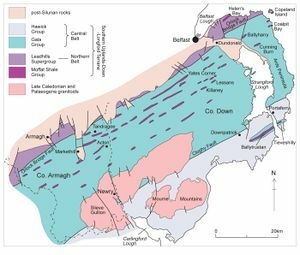 Subsequent recognition of a variety of way-up sedimentary indicators in the turbidite successions of southwest Scotland and of Co. Down challenged this interpretation and demonstrated that the strata face or young predominantly to the northwest . Folds certainly occur but their northwest-facing limbs tend to be much the thicker. The apparent contradiction between palaeontological and sedimentological evidence is the fundamental Southern Uplands paradox. It can be solved only by the insertion of numerous major faults parallel to the strike , . The strata indeed young predominantly to the north but the strike-parallel faults repeatedly throw down younger beds on their southern side (P947803). These major strike-parallel faults, typically spaced at between 1 and 5 km, segment the terrane into a number of blocks or tracts of similar width . Detailed mapping has confirmed the presence of such faults and has highlighted subtle differences in stratigraphy and lithology between the adjacent fault-bounded tracts. The tracts in the Northern Belt and at least in the northern parts of the Central Belt expose successions of thick turbidites resting, typically with sharp, commonly tectonised, but essentially conformable boundaries, on fossiliferous black and grey mudstones of the Moffat Shale Group. In very rare cases the mudstones rest directly on spilitic pillow lava of the Crawford Group . The precise age of the contact between the Moffat Shale Group and the base of the succeeding turbidite sequence differs from tract to tract, decreasing incrementally southward by the equivalent of one or two graptolite zones per tract (P947804). The turbidite successions which rest on the Moffat Shale Group also differ across the tract boundaries, subtly or profoundly, in both thickness and lithology. However, within each individual tract the lithostratigraphy is relatively constant and may be correlated for many tens of kilometres ENE-WSW along strike. 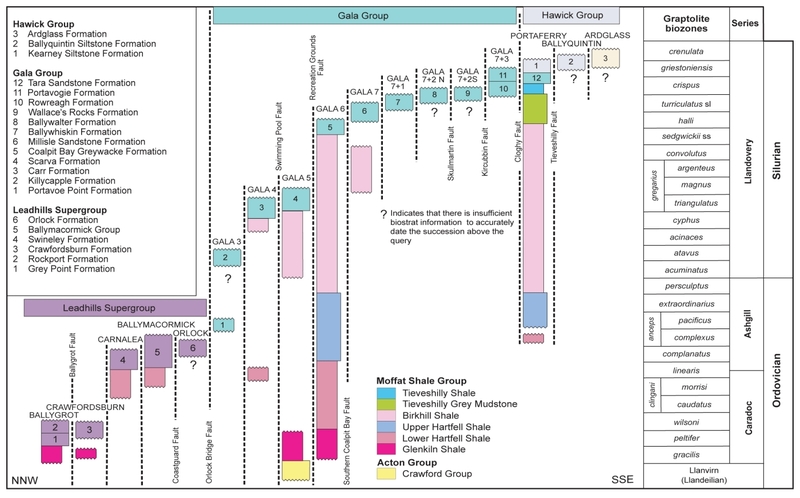 Each tract thus demonstrates its own unique version of the overall stratigraphic theme, with the Moffat Shale Group as the only truly common stratigraphic element. A further very important feature of the tectonostratigraphic pattern is that all successions are terminated stratigraphically downward and upward by faults. The oldest basement rocks in the Southern Uplands-Down-Longford Terrane are the outcrops of pillow lavas of possible Arenig age, which are seafloor ‘basement’ and represent the surface onto which the marine successions were deposited and from which they were subsequently stripped . These observations and relationships were initially addressed in the Southern Uplands accretionary prism model  and later refined in the light of the then newly emerging theory of plate tectonics . According to the model, black hemipelagic mudstone deposited on the floor of the Iapetus Ocean was carried toward the fore-arc trench as the oceanic plate was subducted northwestward beneath Laurentia. As each segment of the oceanic plate approached the trench it came within reach of turbidity currents bringing detritus from the continental margin located to the north and northeast. Thick turbidite fans, advancing diachronously southward, were thus deposited directly and rapidly on the black mudstones. As the oceanic plate continued to be subducted, packets of these sediments were detached from the descending slab from time to time and accreted to the Laurentian continental margin as a growing stack of underthrust slices. The northwestern Ordovician tracts accreted first, while sedimentation continued to the southeast. Sedimentary evolution and subsequent deformation both migrated diachronously northwest to southeast across Iapetus for some 40Ma until that ocean finally closed. The model explained the major features of the terrane and its unusual tectonostratigraphic pattern. However, the model, at least in the simple form outlined above, does not explain the occurrence, in southwest Scotland, of volcanic arc detritus in some late Ordovician turbidites whose sole-markings consistently indicate a southeasterly provenance. This and other observations prompted the development of an alternative interpretation of the Southern Uplands-Down-Longford Terrane as a back-arc basin thrust stack . This model contends that the Southern Uplands turbidites and mudstones accumulated in a back-arc situation between the Laurentian continent and an outboard volcanic arc, deriving clastic detritus from both. Convergence and ultimate collision between arc and continent during the Silurian Period generated a rising stack of thrust sheets progressively overthrusting one another to the southeast until the basin was consumed and inverted. The ensuing debate between proponents of the two models has become known as the ‘Southern Uplands Controversy’. It is important to recognise that, whichever is preferred, both models require the pattern of sedimentation, subsequent accretionary deformation and associated thrusting to migrate northwest to southeast as the Iapetus Ocean, or back-arc basin, closed. ↑ Lapworth, C. 1878. The Moffat Series. Quarterly Journal of the Geological Society of London, 34, 240–346. ↑ 2.0 2.1 Peach, B N, and Horne, J. 1899. The Silurian Rocks of Britain, Vol. 1. Scotland. Memoirs of the Geological Survey of the United Kingdom, HMSO. ↑ 3.0 3.1 Craig, G Y, and Walton, E K. 1959. Sequence and structure in the Silurian Rocks of Kirkcudbrightshire. Geological Magazine, 96, 209–20. ↑ Anderson, T B, and Cameron, T D J. 1979. A structural profile of Caledonian deformation in Down. In: Harris, A L, Holland, C H, and Leake, B E (eds.). The Caledonides of the British Isles, reviewed. Special Publication of the Geological Society of London, No. 8, 263–7. ↑ Geological Survey of Northern Ireland. 1997. Geological Map of Northern Ireland. Solid Geology (second edition). 1:250 000. (Keyworth, Nottingham: British Geological Survey). ↑ Sharpe, E N. 1970. An occurrence of pillow lavas in the Ordovician of County Down. Irish Naturalist’s Journal, 16, 299–301. ↑ Anderson, T B. 2001 (for 2000). Structural interpretations of the Southern Uplands Terrane. Transactions of the Royal Society of Edinburgh: Earth Sciences, 91, 363–73. ↑ Mitchell, A H G, and McKerrow, W S. 1975. Analogous evolution of the Burma orogen and the Scottish Caledonides. Bulletin of the Geological Society of America, 86, 305–15. ↑ Stone, P, Floyd, J D, Barnes, R P, and Lintern, B C. 1987. A sequential back-arc and foreland basin thrust duplex model for the Southern Uplands of Scotland. Journal of the Geological Society of London, 144, 753–64. This page was last modified on 25 September 2017, at 14:02.